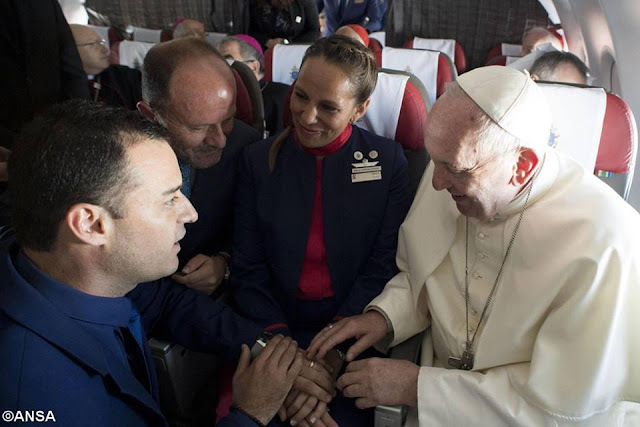 Pope Francis performs the first-ever papal marriage ceremony aboard a plane, during his trip to Iquique on Thursday, the final day of his Apostolic Visit to Chile. The newly-weds - Paula Podest Ruiz and Carlos Ciuffardi Elorriaga - are flight attendants for LATAM and met 8 years ago aboard a plane. They were married civilly in 2010. However, they were unable to follow up with a Sacramental marriage because their church was destroyed before the ceremony by an earthquake, which hit Chile that year. Greg Burke said, "Doctrinally it's OK, because to be married the actual ministers are the people themselves. You just need a witness. There are a couple other things, normally there are publications. And there were things that had to passed over, but it's totally legit, and everyone's happy!" He said it "was not the Pope's idea; it was their idea, but the Pope was happy to do it." Pope Francis was enroute to Iquique to celebrate Mass on the final day of his Apostolic Visit to Chile.